A California lawmaker has proposed a bill that would ban SeaWorld San Diego’s use of orcas in its shows. Assemblyman Richard Bloom, a democrat representing Santa Monica, said he was inspired to sponsor the bill after seeing the documentary, Blackfish, which details the 2010 death of SeaWorld Orlando trainer, Dawn Brancheau. If passed, the orcas, or killer whales as they are commonly called, would be released into large, outdoor pens. The bill would ban the use of orcas for entertainment purposes and prohibits captive breeding. It was released Friday and met with strong opposition in San Diego. SeaWorld questioned the validity of the legislation, while others were concerned with the economic ramifications of a law banning the use of orcas in SeaWorld shows. 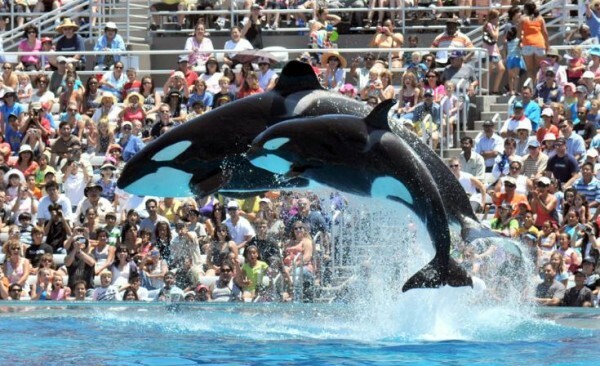 San Diego Mayor Kevin Faulconer said that SeaWorld is a major part of the city’s economy. “In addition to drawing thousands of tourists,” he said, “it is also a leader in maritime and wildlife conservation.” The republican mayor ran his recent campaign on the promise of job growth and he believes there are more pressing matters in the state than SeaWorld San Diego. Assemblyman Rocky Chavez also opposed the bill. Chavez, a republican representing Oceanside, said that he could not support any bill that takes away from the identity of the San Diego area, which would affect tourism and eventually strip the region of jobs. SeaWorld San Diego is host to 4.4 million visitors a year, more than the San Diego Zoo, and employs 2,500 people, a number that jumps up to 4,500 in the summer season. But in an article in the same U-T San Diego paper, Dan McSwain wrote that the days of orcas performing at SeaWorld are numbered. SeaWorld competes with other parks by offering numerous exhibits of other sea animals, a children’s play area, and a roller coaster. McSwain argues that public opinion is moving in the direction of treating animals, especially those with higher intelligence, in a more humane manner. Maybe it is time for SeaWorld to evolve into an eco-resort and continue to teach children about maritime wildlife, McSwain says. A bill that bans SeaWorld from using orcas for entertainment purposes is unsurprisingly supported by PETA and the director of Blackfish. But there is some support coming out of the San Diego area. Assemblywoman Lorena Gonzales, a democrat representing the 80th district in southern San Diego, is supporting the bill despite the potential economic fallout. And to a lesser extent, Assemblywoman Toni Atkins, another democrat representing the 78th district in San Diego, said that she has not seen the bill yet but will consider both the economic consequences and Bloom’s position on the issue. 11 Responses to "Seaworld Faces Ban of Orcas"
What problem would it solve? Cruelty to animals, obviously. Warehousing animals is not a way to save animals from extinction rather protecting their habitats is the way. Of course, being so bored, we humans have to be entertained by animals that are dangerous like Orcas. A trainer killed by an Orca. Heeellllooooo? We are concreting our world, filling landfills, warehousing animals in zoos, circuses, rodeos, and other crimes against nature. Oh, we don’t have to worry. Mother nature will take care of herself most likely by the extinction of the human life on the planet. It’s just a matter of time. Once the liberals take away everything. Maybe we can all walk, talk, act and spend the same. Hey, let’s all dress the same too! lol. Next lets ban boxing cause it’s violent for children. Let’s ban hitting to the head in football–oh wait, that’s already happened. What kind of world do you want to live in, in 30 years? I sure as hell don’t want my car driving for me, I don’t want my kid ostracized for punching another kid in school cause it’s a normal human behavior punished in a non-violent society, I do not want to bath in filtered water, I do not want to eat all organic food cause it’s good for me, I do not want the gov’t to decide what is good or bad for me by TAKING AWAY EVERYTHING THAT MIGHT BE BAD. The world isn’t a utopia, never has been, never will be. Deal with it liberals, you’re not changing the world with your ideals, you’ve lost touch with reality. I say let’s slaughter those whales just to make sure we remember why we struggled for 1000’s of years to get to the top of the food chain before some liberal in 20 years bans meat. You relieved me from crafting my comments. You said it all. I agree. I’ll only add that I support freedom and personal responsibility, and not the nanny state. The Government is not your friend. 2A folks. We ARE the government so look in the mirror. Every one of you would eat those whales if you were starving to death. stupid. orcas are mammals same as humans let’s ban “reality tv” first. how is seaworld differ from say big brother. mammal housed for entertainment. …. Other then the pofiteers at Sea World and some children, are there any who actually believe that keeping Orcas or Dolphins in a tank,no matter how big the tank might be,is a great idea? No sentient being should be confined against its nature and will and set to perform for our entertainment. Same goes for circus acts. Time to end the pain. I understand the desire to do something for these creatures, but not convinced this attempt will be successful. The film make a solid argument that these are far smarter animals than many realize. But it seems odd for the bill to only target a single intelligent species. What about Chimpanzees, Gorillas, Dolphins? There are a lot of intelligent species that live in cages throughout California, the US, and the world. Some for entertainment, others for research. Who draws the lines about which species to protect and which not too? Do we cherry pick the cute ones we’re familiar with (thanks to SeaWorld), or is this an issue that needs to be handled more broadly through something equivalent to the endangered species act (an intelligent species act?)? I also watched the Blackfish documentary and totally support Richard Bloom’s legislation to ban Orca whales from Sea World (or any other) shows. These incredible and intelligent creatures should be free to roam the oceans where they belong, not imprisoned in small tanks in order to provide amusement to those uneducated or unconcerned of the whales’ plight.